The tiny house stolen on Sunday night from outside the Smartdeck office in Mitchell. 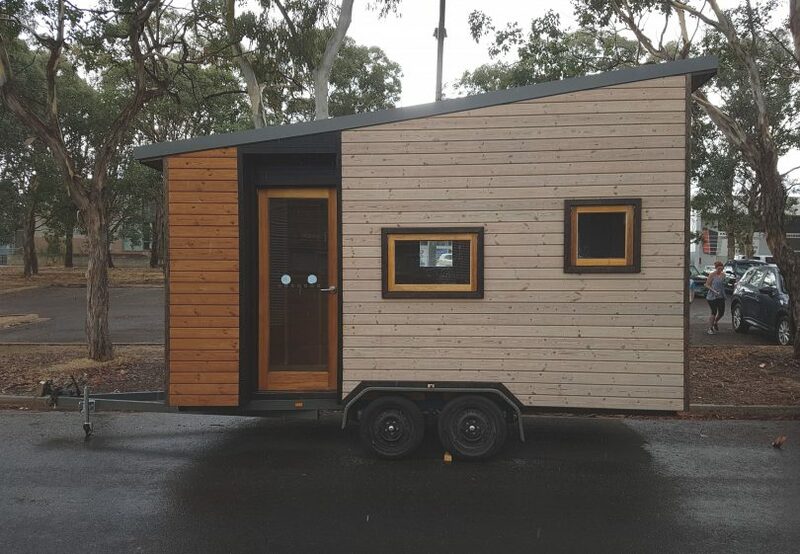 A relieved Jules Bray is hoping to have her prototype tiny house back for the Canberra Home and Leisure Show in October after it was located by police in Queensland. A 24-year-old man has been bailed to face court in Hervey Bay on October 5 after being charged with bringing stolen goods into the state. Ms Bray, co-owner of Mitchell business Smartdeck, thanked the-riotact.com for publicising the theft of the house from outside the business on Sunday night, and the people who responded through Facebook to her calls for help to locate it. “Thanks to everyone who shared it, responded with the sightings, and contacted the police. It’s remarkable that it was found so quickly and that it went so far,” she said. She said the tiny house was found in good condition in a storage facility in Hervey Bay where the owner recognised it on CCTV and contacted police. He and a Kingaroy man, who she called after he sighted the house there on Monday at 5.30 pm, would likely share the $1000 reward. She said the Kingaroy sighting switched the focus of the search to Queensland where she posted calls for help on local news sites. “I didn’t believe it at first, but he was able to describe bits of the house that aren’t in the photo,” Ms Bray said. The house and trailer are being held as evidence but she hopes Queensland Police will release them soon for transport back to Canberra. She said it would be costly because the house was not registered for the road and would have to be trucked back. Smartdeck plan to start manufacturing the tiny houses at the end of the year. “I’m so relieved that I don’t have to start from scratch again,” Ms Bray said. ACT Policing said it was investigating the theft and officers had spoken with Queensland Police in relation to the arrest of the 24-year-old man. ACT police would be speaking to the man.